Get 3-½ “performance out of 2 ¾” shells. The Super Buck round was developed specifically to overcome the shortcomings that plague standard 2 ¾” 9 - ‘00’ buckshot loads in widespread circulation. Some manufacturers are even going to an 8 pellet 00 buckshot load. 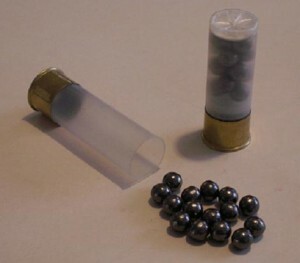 A single Super Buck round throws 15 pellets per shot fired, almost twice that of the Remington Tac 8 or the Managed Recoil* round. The muzzle velocity from a 19” barrel is 1,100 fps which delivers nearly 2,200 foot/pounds energy from its 1 7/8 ounce payload. Make that first shot count with the Super Buck.